The advent of tropical medicine was a direct consequence of imperialism, when military personnel, colonial administrators, businessmen, and settlers encountered a new set of diseases endemic to the tropics. European doctors and scientists worked together across borders to establish the new field of tropical medicine in the late nineteenth and early twentieth centuries. This transnational collaboration in a context of European colonialism, scientific discovery, and internationalism shaped the character of the new medical specialty. Even in an era of intense competition among European states, practitioners of tropical medicine created a transnational scientific community through which they influenced each other and the health care that was introduced to the tropical world. Scientists and doctors collaborated across borders to control, contain, and find a treatment for the diseases. In the late nineteenth and early twentieth centuries, interest in tropical diseases was transformed into a new medical discipline – tropical medicine. While the idea of diseases being associated with hot or warm climates has a much longer history, the concept of tropical disease that emerged by 1900 was different. This new discipline sought to distance itself from earlier ideas of disease and climate and establish itself on a foundation of the new sciences of parasitology and bacteriology. With the discovery of the causal organisms of many of the major tropical infections, hopes increased for preventing or treating some of the world’s deadliest diseases. The ‘new’ tropical medicine was intricately associated with empire and an intense nationalistic fervor, but in each setting tropical medicine also shaped and was itself shaped profoundly by the local environment in the broadest understanding of the word. The specialty developed to protect the health of colonialists and their workers and had a strong base in classical parasitology. This “new tropical medicine” attracted private philanthropy, had an institutional basis and journals that could link and publish the work of a competitive and nationalistic international community of researchers and practitioners. Additionally, in the late nineteenth century many medical graduates were working in different parts of the British empire. Other countries were also acquiring overseas possessions and the founding of the Liverpool (1898) and the London (1899) Schools of Tropical Medicine in Britain was followed by similar institutions in Europe and North and South America. While the formal beginnings of tropical medicine in the British Empire are associated with Patrick Manson and the founding of the London and Liverpool schools, tropical disease was neither new nor confined to the tropics. Much important work was being undertaken away from metropolitan centres of the British empire. Despite the crucial contributions by Patrick Manson, many others such as Pasteur, Laveran, Koch, Grassi, Ross, Finlay and Reed also merit to be listed among the founders of Tropical Medicine. Indeed, European colonial powers such as England, France, Spain, Portugal and The Netherlands had been facing tropical diseases affecting their initiatives in Africa, Asia and Latin America from the XVIth century. Patrick Manson was a British helminthologist born on October 3rd, 1844, in Oldmeldrum, Aberdeenshire in Scotland. At the University of Aberdeen, he graduated with the degrees of bachelor of medicine and master of chirurgie in 1865. In 1866 he got a position of assistant medical officer at the Durham Lunatic Asylum in England where he wrote his doctoral thesis on an affection of the carotid artery related to brain diseases. This same year he was posted to Takao, Formosa (present Taiwan), where he joined the Chinese Imperial Maritime Customs. His duties were to inspect ships at port, treat crews, attend the native missionary hospital, and maintain a meteorological record, while he was additionally able to conduct a private practice. After marrying while on leave to England in 1875, he moved to Amoy in China where he carried out many important helminthological studies. His observations on the development of microfilariae in mosquito vectors and the periodicity of microfilaraemia in the blood with regard to the nematode Filaria sanguinis hominis (the filarid species Wuchereria bancrofti), his discovery of the cestode Spirometra mansoni, and his participation in the recognition of the trematode Paragonimus westermani should be emphasized during this period. Again after a visit to Britain in 1982, he returned to Asia, namely to Hong Kong in 1883, where he took a leading part in the foundation of the Hong Kong College of Medicine for the Chinese becoming its Dean in 1887. Back to England in 1889, he started practicing in London the following year. It was in the year 1891 when he discovered the microfilarid stage of Loa loa, as well as the filarid species perstans which was after decades ascribed to a new genus named in his honor, Mansonella. The year after he was appointed physician to the Albert Dock Hospital of the Seamen's Hospital Society. The Secretary of State for the Colonies, Joseph Chamberlain, was impressed by Manson's lectures devoted to 'tropical medicine' at several London medical schools. Chamberlain immediately thought at the possibility of sending Colonial medical staff on leave in Britain to these lectures, in the way to give an update on the prevention and management of these diseases whose morbidity and mortality were affecting the 'constructive imperialism'. Despite a great deal of opposition, clinical tropical medicine emerged as an important medical specialty and scientific discipline, basing on the recently recognized importance of parasites and their vectors in the transmission of diseases. Chamberlain considered 'tropical medicine' an essential component in the future development of British economic and social imperialism. It was, thus, to become a 'colonial science'. A new section devoted to Tropical Medicine was inaugurated in the British Medical Journal in 1897. To implement the development of the 'new' discipline, Manson was appointed Medical Officer to the Colonial Office in 1897. The collaboration of Manson with Chamberlain became crucial. It was with the support of Chamberlain that he finally succeeded in establishing a School of Tropical Medicine in London, which was founded in 1899. During the period from 1894 and 1898, he worked together with Ronald Ross in an association which proved to be highly successful. A contribution of this period is the discovery of malaria transmission by mosquitoes. Other landmarks were the description of another filarid affecting humans, ozzardi, a species which has also been included in the genus Mansonella, and, in 1902, the observation of the lateral spine on the egg of a human fluke which was later named after Manson, Schistosoma mansoni. It was in 1898 when he published the first edition of "Tropical Diseases: A Manual of the Diseases of Warm Climates", one of the first books on exotic pathology, a book of which successive editions have continued to appear even until nowadays. 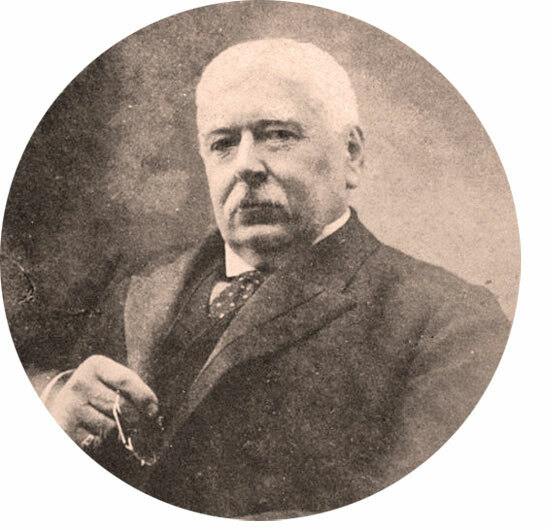 Patrick Manson became the first president of the Society of Tropical Medicine and Hygiene in 1907, today known as the Royal Society, and was made a Companion of the Order of St. Michael and St. George in 1900, was awarded the Fothergill medal in 1902, and received honorary doctorates from the Universities of Aberdeen in 1886 and Oxford in 1904. He was knighted KCMG in 1903 and GCMG in 1912. He retired from the Colonial Office in 1912. Manson was an impressive man in intellect, personality and also in appearance. He was affected by gout during the last part of his life and finally died at the age of 77 years in London on April 9th, 1922, being universally mourned. 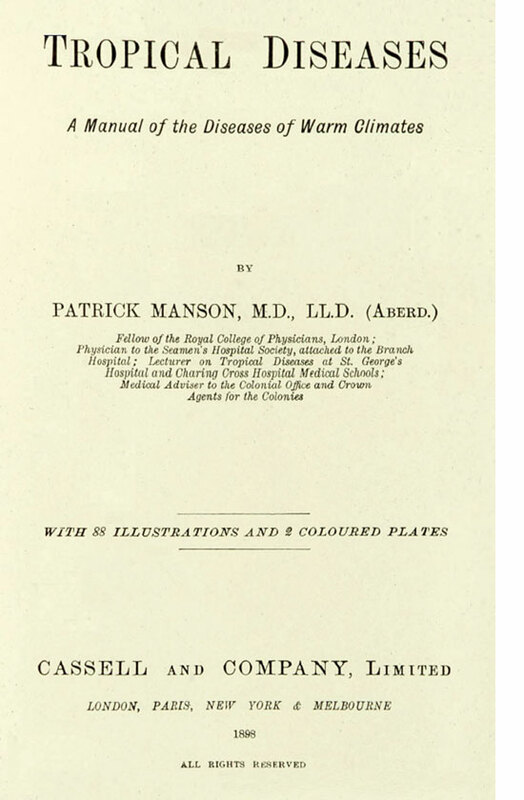 Patrick Manson has frequently been acclaimed as the "father of tropical medicine" in the British empire because of his outstanding contributions. Arnold, D., 1996. Introduction: Tropical Medicine before Manson. In: Warm Climates and Western Medicine: The Emergence of Tropical Medicine, 1500-1900 (D. Arnold ed. ), Clio Medica Vol. 35, Wellcome Institute Series in the History of Medicine, Editions Rodopi, Amsterdam-Atlanta, pp. 1-19. Cook, G., 2007. Tropical Medicine. An Illustrated History of the Pioneers. Academic Press, St. Alban, Herts, UK, 280 pp. Cook, G., 2009. History of Tropical Medicine, and Medicine in the Tropics. In: Manson's Tropical Diseases, 22nd Edition (Gordon C. Cook & Alimuddin I. Zumia ed. ), Saunders- Elsevier Ltd., Printed in China, pp. 1-8. Enigk, K., 1986. Geschichte der Helminthologie in deutschsprachigem Raum. Gustav Fischer Verlag, Stuttgart - New York, 356 pp. Grove, D.I., 1990. A History of Human Helminthology. CAB International, Wallinford, Oxon, UK, 848 pp. Lapeyssonnie, L., 1988. La Médecine Coloniale. Mythes et Réalités. Editions Seghers, Collection Médecine et Histoire, Paris, 310 pp. Neill, D.J., 2012. Networks in Tropical Medicine. Internationalism, Colonialism, and the Rise of a Medical Specialty, 1890-1930. Stanford University Press, Stanford, CA, xiii, 292 pp.